After a summer in their own customized black hole, Kode9 & Spaceape emerge with this single, providing a preview from their incoming album, “Memories of the Future”(Hyperdub Oct 2006). Featuring two of Spaceape’s most upfront vocals yet, ‘Curious’, opens in the wind tunnel, laced by the lush vocals of new recruit to the Hyperdub Kru, Ms. Haptic, and refrains with Spaceape’s infectiously ambivalent chorus – “Maybe just maybe we will save you. . .Maybe just maybe we will kill you”. 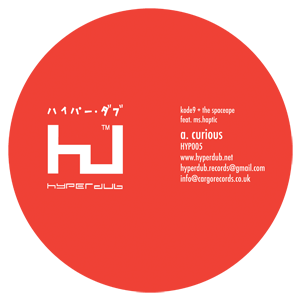 Rushed along by its bustling hi-hats, ‘Curious’ drops into Hyperdub’s customary wall of sub. A wake up call to dub zombies everywhere.